It may be time to invest in a tweed jacket and some hunter boots! 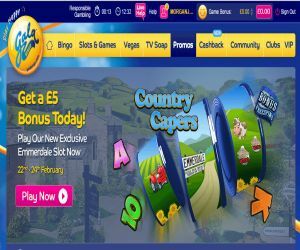 As Gala Bingo has stepped up it's game with the launch of its brand new, exclusive Emmerdale ‘Country Capers' Slot! Ever since Gala Bingo started it's collaboration with the UK's hit show Emmerdale, we've started to find a new-found passion for the country life! As seasoned city slickers here at Lord Bingo, the new Emmerdale-themed country promotions have provided a fresh breath of fresh air from the non-stop pace of city life! We even began to see the appeal of country walks, Ranger Rovers, village life, tweed, ponies and hunter boots! Hot on the heels of Gala's popular Emmerdale bingo room, now you can get closer to the village-style action with Gala's new, exclusive Emmerdale Country Capers' Slot! The reels of the new slot are dripping with iconic country symbols, from comical cows and sheep to horses and village signs. Watch out for the Lampede as sheep race across the screen, the reel sheep frenzy feature and the Ram-bo reels where a ram charges onto the screen to bring new bonus symbols. The game also features the reel swap where symbols swap positions, a Sheep Auction and the 3x Awards Take Yer Pick Feature, where you can play Pub Darts or check out the Village Notices! Try it for a £5 bonus!! To kick-start on your scenic adventure, Gala Bingo is offering an exclusive £5 Bonus until tomorrow, Wednesday, 24th February! All you have to do is click on the deposit page and use the Emmerdale-style bonus code: DALES. Then you can deposit £10 in cash on the awesome new Emmerdale Slot Game. Before you've had time to grab your wellies, you'll instantly receive a £5 All Slots Bonus! Go wild and don't forget your wellies!